Weekly deliveries to the UK, Scotland, Ireland and throughout Europe! Best selling models of 2018 at a glance! 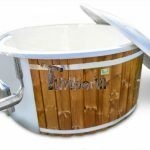 Wood-fired hot tubs, wooden hot tubs directly from the manufacturer – TimberIN factory! What does that mean? 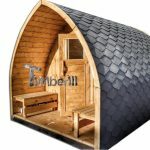 You will get the unique TimberIN-branded, high-quality product. There are many similar looking products on the internet but if you want to be certain about the quality of each aspect of your purchase, choose TimberIN! Much safer purchase process. You would transfer your funds directly to the manufacturer, no third-party persons involved – no risks! Much safer transportation process. You will obtain the product directly from the factory, no extra reloading! This is very important to keep the product damage – free due to transportation caused problems! ‎Thanks to your direct communication with the factory your order will be produced as precise as possible. Involving the third parties (resellers) in the purchase process would always increase the possibility of wrongly understood and therefore manufactured the product. We do bespoke models! The possibilities are endless! Have an idea of a differently designed model? Share it! Real warranty provided directly by the manufacturer. Buying from the reseller would often limit the warranty services since in case of malfunction, the reseller will contact the manufacturer and in the end, nobody would want to take the responsibility. As the result, the customer would lose time and money. ‎Thanks to the elimination of the resellers, you save up to 20 – 30 % on all high-quality products. Customers would rather spend this amount on better quality wood and SPA equipment than paying the resellers for their services. ‎95 % of customer satisfaction rate and more than 500 positive reviews Europewide would not lie! Visit our main website www.timberin.com, select the country and get to know more about us! Also, please do not forget to read our blog articles. ‎TimberIN brand production line has been officially certified by European Union Intellectual Property Office (Certification No. ‎016147597) and registered to the European Union trademarks. Are you looking for a relaxation and wellness option for your garden? Then a wood-fired hot tub or a wood-burning hot tub is just the right thing for you! Wood burning hot tubs are made of high-quality wood – mostly made of Nordic spruce, larch or thermowood. An all-around enriching and completely healthy wellness experience. Our offer is aimed at people from the UK or Scotland but is suitable for everyone – from young to old. It should be noted that there are different terms such as wood-fired hot tubs; wood burning hot tubs or simply put wooden hot tubs. We would like to introduce you to these so that you can find the best product for you and your individual needs when making your purchase. Every single product is of high quality. The wood is perfectly processed and suitable for long-term use. With a hot tub, you have the above-mentioned wellness and relaxation options also in addition to many more benefits. In the longer term, you save a lot of money for visits to expensive wellness centres. With the wooden hot tub, you can bring wellness to your home and use it whenever you want. The hot tub is set up outdoors – ideally on a meadow with flat terrain. You can choose from different shapes and sizes. Choose from different models and finishes including accessories for all variations. There are natural wooden hot tubs and those that are lined with fiberglass. There is a clear difference in price between wood and fiberglass, whereas those made of fiberglass are a little more expensive – but last longer. The wood burning hot tubs come with completely insulated walls, floor and lid – if desired, thus providing complete insulation and protection against heat loss. The cleaning and maintenance of a hot tub are very easy and inexpensive, with simple cleaning agents. In addition, you can install a complete SPA system. This SPA system includes a bubble massage system and a water massage system. In addition, you have beautiful LED lights, which are particularly durable and straightforward. Walls and benches are customizable on all plastic models and individually configurable. Even with the colour selection, you have an extensive colour palette available. In addition, you have a low water capacity of 1400-16000 litres and the fiberglass benches contribute to water reduction. Also in terms of weight, you have a real top product! Compared to wooden hot tubs, the hot tubs with a liner are unbeatable. Basic weight: 160-180 kg. The hot tubs are designed for long life and do not need to be constantly replaced. With the purchase of a hot tub, a year-long pleasure is guaranteed! The wooden hot tub is 100% natural. So you are closer to nature. This version is a little more economical and flexible. In addition, it may be under circumstances that a timber design fits better into the environment. Whether a wooden hot tub or a wood-fired hot tub with a liner, with this product you have a wellness package, where you can recover from the stressful everyday life. Colloquially, bathing tubs are also called Whirlpools- after all, these are exactly the same as an outdoor hot tub or jacuzzi. What is wood burning hot tub? A wood-burning hot tub is the latest trend from Scandinavia and the Baltic area and is also very popular in Germany, Austria and Switzerland. But what exactly is a hot tub and what sets it apart from a classic wooden hot tub? The wooden hot tub was a tradition in Scandinavia and the northern countries over several thousand years. This wooden tub filled with hot water has only recently become an absolute trend in Central Europe. In addition, it is ideal for a social evening useful, as several people (depending on the version up to 8). The water in the wooden tub is heated by a special stove and brought to the right temperature. How do you heat a wooden hot tub? In order to bring the water to the right temperature, a small wood stove or an electric heater is required, which is included in the delivery. The wood burning stove of the wellness royal model is thereby completely integrated into the tub. This is designed so that most of the heat from the fire is channelled into the water and almost no heat energy is lost. It is enormously important that you only heat when there is water in the barrel, otherwise heating with no water could melt the liner or even catch fire. So if you have filled the water in the wooden hot tub to the point marked, you can easily heat up the stove. The stove only gets as hot as the water itself. The only thing that gets hotter is the oven door and the fireplace of the stove. You should therefore not touch this. Drywood is ideal for heating. Hardwood has an ideal calorific value for the stove of your wood burning hot tub. In addition, there are oils and solutions that you can put into the water, this helps with the relaxation and can also be healing as well as cleansing for your skin and your body. Of course, there are different variations for every wellness fan – depending on your own preferences, you can order various accessories from us in the shop and set up your bath individually. For ultimate relaxation right in your own garden or on the terrace. 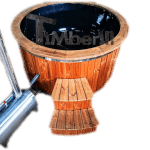 Well, you should by now have probably seen many companies offering wood-fired hot tubs, why is TimberIN different? TimberIN Baltic SPA & Saunas has been officially certified by European Union Intellectual Property Office (Certification No. 016147597) and registered to the European Union trademarks. We are excited to announce the launch of our new Bluetooth thermometer “TimberTEMP®” – a revolutionary accessory to simplify the wooden hot tub water heating process. This thermometer is a product of our ongoing collaboration with Kaunas University of Technology (KTU) to bring innovations to the field of outdoor wooden hot tubs. Outdoor wood-burning hot tubs in 2 Minutes! Get to know them! This website enables to design a wood burning hot tub or an outdoor sauna individually. (1) Select a wood type. Wood fired hot tubs from Siberian spruce, larch, thermowood, oak or red cedar can be selected. Thermowood`s origin is spruce processed in high temperature. As a result, it enables to withstand harsh climate conditions and minimize the humidity caused deformations. (2) Fiberglass or polypropylene colour of wood-fired hot tubs. Polypropylene liners are available in blue, grey, white or black. Fiberglass liners are available in any of your desired colours from RAL (ralcolor.com). 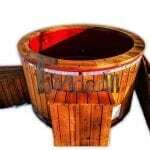 (3) Diameter: For polypropylene lined wood-fired hot tubs the diameter range is 1600 – 2200 mm. However, we do have rectangular models as well. All our fibreglass models come in 1850 mm of inner diameter. (4) Type of wood burning hot tub heaters. The most popular selection is snorkel (inside) stainless steel heater. Also, we have a wide selection of external heaters. The difference is that the external heaters don’t take space and, therefore, more persons can enjoy the wood-fired hot tub at the same time. We do offer heaters prepared in 430 or 316 stainless steel. 316 stainless steel is necessary if chlorine, water salts or any other water treatment solutions are used. The last but not least is an electric heater. It is quite a comfortable solution where wood usage is not the case. Also, one can combine and install both wood-fired and electric heater. (5) Type of stairs. Wood fired hot tubs can be equipped with 4 types of stairs. They differ in size and design. 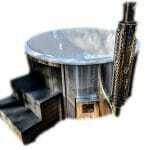 To see the designs we offer, please select the particular model of wood-fired hot tubs and click 3D section next to the description. (6) Type of lids. 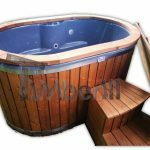 Wood fired hot tubs can be equipped with wooden, polypropylene or fibreglass lids. Nature of the lid depends on the type of wood-fired hot tub. (7) Type of benches. We offer 3 different types of benches, however, it very much depends on the model of the wood-fired hot tub. 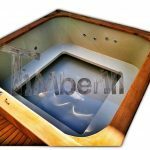 While the wooden hot tubs will have only wooden benches, wood-fired hot tubs with polypropylene liner can be built with wooden and polypropylene benches. Since polypropylene is artificial material, it would last definitely longer. Wooden hot tubs, outdoor whirlpools with LED, massage systems, filtration and more! (1) External water tap (optional). Stainless steel tap with a valve which enables to drain dirty water more easily. 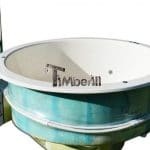 Every model of wood-fired hot tubs comes with a loose hose connector (plug with the stopper) which is to be installed at the bottom. (2) LED lights (optional). Led lights can make the experience of bathing way better. We can install as many as you like but the most popular option is 3-4 units. The led bulb has 5 different colours which can be changed with the help of remote controller fitted to the tub`s wall. Walls of wooden hot tubs must be insulated. (3) Hydro massage system (optional). This massage system comes with 6 jets which are already pre-installed into the walls of the wooden hot tubs with fibreglass liners. Wooden hot tubs with massage systems must be insulated. (4) Air bubble massage system (optional). Air massage system comes with 12 jets. It can be used together with hydro massage system or separately. The main difference between these two massage systems is that the hydro massage is much stronger and the water current is stimulating your body. Air bubble system, on the other hand, makes you feel more relaxed and tension free. Air bubble jets are installed into the bottom of the wooden hot tubs. (5) Water filtration system. 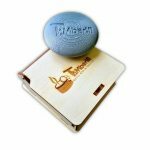 This accessory is very useful and all wooden hot tubs should have one pre-installed. (1) Wall thermal insulation of wood burning hot tubs is a very common choice because it is necessary for massage systems to be installed properly. Also, it enables to keep water warm longer. (2) Floor insulation: The biggest loss of heat is through the floor since the ground is always a cold surface. Floor insulation helps to prevent it. (3) Lid insulation: Together with the above-mentioned insulation options, lid insulation completes it all. With fully insulated wood burning hot tub one will be able not just to save energy heating the water but warmth will stay there much longer! Throughout Europe: Austria, Switzerland, Belgium, France, Denmark, the Czech Republic, Poland, Liechtenstein, Luxembourg, Italy, Spain, Ireland, Great Britain, Hungary, Slovenia, Slovakia, Romania, Latvia, Estonia, Norway….